Children now make up over a third of the migrants making the perilous sea crossing from Turkey to Greece, the UN has said, as two more babies drowned off Europe’s shores. For the first time since the start of the migrant crisis in Europe, there are also now more women and children crossing the border from Greece to Macedonia than adult males, according to UN children’s agency UNICEF, in a report on Tuesday (2 February). The figures emerged as Europe struggles with its biggest movement of people crisis since World War II, with more than a million people fleeing war, violence and poverty risking life and limb to reach its shores last year. “Children currently account for 36 percent of those risking the treacherous sea crossing between Greece and Turkey,” the UNICEF spokeswoman Sarah Crowe said. “Children and women on the move now make up nearly 60 percent” of those entering from Macedonia, she added. The figures mark a significant shift since June, when 73 percent of migrants were adult males and only one in 10 were under the age of 18. Marie Pierre Poirier, UNICEF’s special coordinator for the refugee and migrant crisis in Europe, said women and children were even more vulnerable to the dangers of trying to travel to Europe. “The implication of this surge in the proportion of children and women on the move are enormous,” she said in a statement. Underlining her point, the International Organization for Migration said Tuesday that one in every five who drowned last month while trying to sail from Turkey to Greece was a child, with minors accounting for 60 of the 272 deaths. Including during January, a total of 330 children have died in those waters over the past five months, many of them just metres from shore, the organisation said. The drownings continue a grim trend that accelerated last year when nearly 4,000 people died trying to reach Europe by sea. 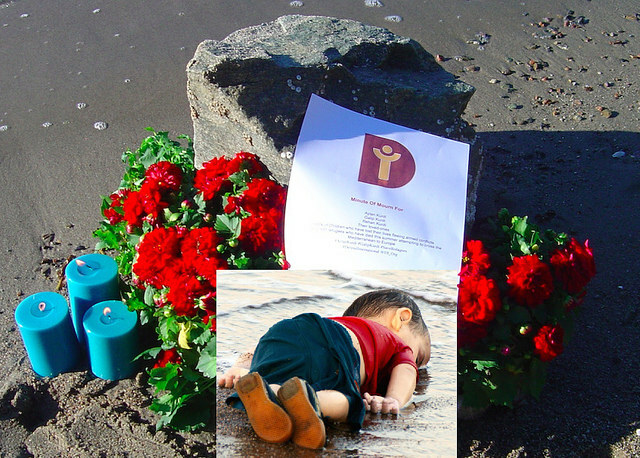 The plight of children was brought home last year when the body of Syrian toddler Aylan Kurdi was found washed up on the shore of the Greek island of Lesbos, horrifying the international community. The bodies of two more babies were recovered by the Turkish coastguard inthe Izmir province on Tuesday along with seven dead adults, just days after another 37 people drowned off another part of the coast. Children were among the dead, an AFP photographer said, although the exact number was unclear. The EU on Tuesday urged Greece to check the flow of asylum seekers to its shores, including better registration and security checks, or risk having border controls imposed with other members of the passport-free Schengen zone. Greece responded by saying the army will do more to help police and port authorities deal with the new arrivals. In January, almost 62,200 migrants and refugees entered Europe through Greece, most of them from Syria, Afghanistan and Iraq, the IOM said, close to a third of them unaccompanied minors. The Europol police agency warned Sunday that youngsters arriving alone were particularly vulnerable to exploitation, abuse and trafficking. More than 10,000 unaccompanied children registered after arriving in Europe over the past 18 months to two years had disappeared, the EU’s law enforcement agency said. Speaking to AFP on Monday, UNICEF’s Crowe said European mechanisms for protecting children had not worked. This “is really a failure of child protection systems across the region”, she said.